Even the most ardent, loyal lover of Bucharest would be hard-pressed to deny that in a beauty pageant of European capitals, Bucharest wouldn't fetch many votes. Known as 'Little Paris' or 'Paris of the East' in the 1920s and 30s, there's little left in Bucharest today to convince the visitor of the merits of this title. [*see editor's comment below] The sad truth is that the majority of Bucharest's buildings date from the communist era when hundreds of thousands of apartment blocks were hastily built at the expense of aesthetic appeal. A great majority of the city's classic architecture, including many homes and religious buildings, was actually leveled during Ceausescu's insane redevelopment projects of the 1980s. But you didn't come here to see sights did you? Truly, most people come to Bucharest for its incredible energy and noisy nightlife - not it's socialism-scarred sprawl. Despite it all, there are still a few architectural gems amongst the dusty, traffic-strangled streets and monolithic apartment blocks - and they shine all the brighter. Most of these are concentrated in the district of Lipscani, often referred to as Bucharest's old historic centre because it was spared Ceausescu's bulldozers. In Lipscani (a small area just south of Piata Universitatii), the contrasts of the city are the most glaring as wood-plank sidewalks guide pedestrians through a maze of decrepit, yet stunning secessionist buildings, hip cafes, cheap eateries, a ruined citadel, abandoned lots, tiny churches, exposed sewer systems and scenes of Roma children playing on discarded construction equipment. In a city with no geographic centre (Piatas Victoriei, Romana, Revolutiei, Universitatii and Unirii all vying), the effect of wandering the unpaved avenues of Lipscani is of having found the true heart and character of a city rent apart by its complex, convoluted history. Undoubtedly, Bucharest's biggest tourist attraction is The Palace of Parliament, originally built as the centerpiece of Ceausescu's 'Centru Civic' project and the dictator's private palace. Today it claims title as the world's second largest building by surface area (after America's super-shady Pentagon building), but also achieves superlatives for being one of the world's ugliest and most unwanted buildings, and one of the most inefficient uses of urban space anywhere in the world. Hard to miss. Bucharest also offers some gorgeous green spaces to escape into when things get too gray to bear. 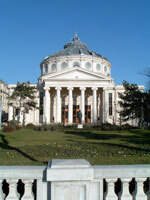 The centrally located Cismigiu Gardens are a tranquil space to relax alone or have a snog on a bench. Meanwhile, northern Buch's Herastrau Park makes a fabulous summer outing with its lakeside cafes and restaurants, fairground relics, flowerbeds and boat rental opportunities. One of the city's more worthwhile sights - the Village Museum - displays Romania's diverse folk architecture on the shores of Lake Herastrau with over 300 dwellings, churches, mills and more. Similar in theme, the Peasant Museum on Piata Victoriei is a fascinating indoor tour of Romanian folklife and handicraft. Tourists looking for a bit more sophisticated culture should (lose the monocle and go clubbing...or) get themselves tickets to a concert at the Romanian Athenaeum - the country's top venue for classical concerts and easily Buch's most beautiful building, inside and out; nearby, the National Art Museum (Piata Revolutiei) showcases the country's best stuff. *Bucharestians nevertheless took it to heart and built their train station ('Gare de Nord') to look like Paris' more famous Gare du Nord, maniacal Ceausescu designed the road leading to his maleficent palace to be like the Champs Elysees (but one metre wider), and somebody pirated the Arc du Triumph, placing it in Bucharest and ensuring that it would be impossible to cross through. (How many second-rate replicas of Parisian landmarks can you find?) 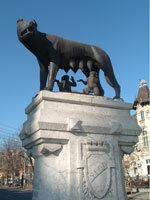 Even the Capitoline Wolf showed up (like so many other stray dogs) to convince Bucharest residents they were in greener pastures.